Few physicians would want to be known as “the cramp doctor.” But sports medicine specialist Doug Stoddard happily turned the moniker into a business opportunity, developing a unique sports drink that he says gives endurance athletes a huge boost. A few years ago, one of Stoddard’s patients – an Ironman triathlete – came to him complaining of terrible cramps when he exercised in hot weather. Stoddard, who runs a sports medicine clinic in Toronto, tried everything. Massage, strengthening exercises, stretching and nothing worked. “Finally, in desperation, I asked him what he was drinking,” says Stoddard. It was a standard sports drink, and like most, low in electrolytes – substances like salt, potassium and zinc which the body lose through sweat, he says. Two years of trials and another year of production and packaging followed. Stoddard, who was medical director of the Subaru Triathlon Series in southern Ontario until last year, tested his concoction on many of the athletes he knew. The result was Eload, a powdered drink that tastes like mild lemonade, and reportedly packs a rejuvenating punch. It isn’t available at grocery and convenience stores like Gatorade, Powerade or any of the other popular sports drinks. That’s partly because Stoddard is just starting out, and partly because he’s aiming his drink at a niche market of athletes. Many of the people who have tried here are triathletes, because Stoddard’s company sponsors an Alberta triathlon race series at which they’ve given out Eload samples and literature to competitors. The only Edmonton store where Eload is currently for sale is United Cycle. Three stores in Calgary stock it, along with about 150 others across Canada. Stoddard says the drink is also great for runners, those who play hockey, football or soccer, and anyone else who sweats. And although it contains more sodium than other sports drinks, it has less sodium than, say, a small order of McDonald’s fries, and only a bit more than a glass of milk. Trevor Soll, president of the Alberta Triathlon Association and director of the race series sponsored by Eload, says reaction to the drink has been great. 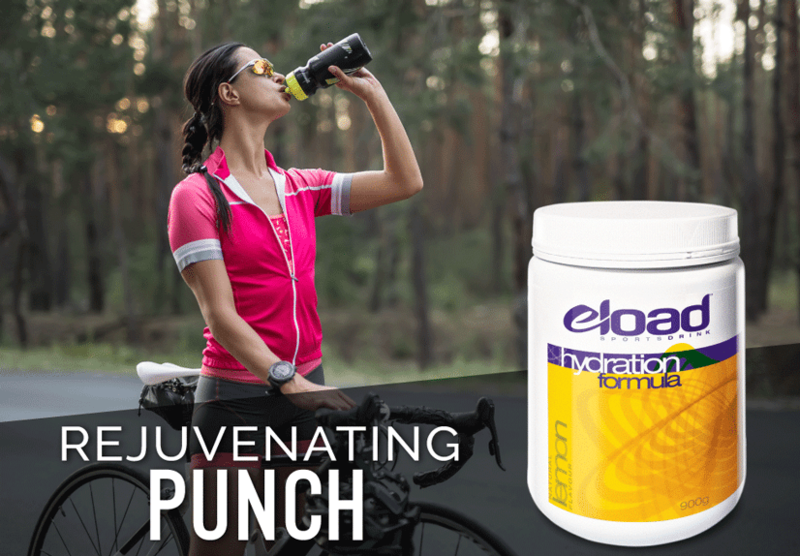 At a recent race in Calgary at which Eload was featured, none of the 400-plus triathletes complained of cramping and about 85 per cent said they liked the drink when asked about it after the race. No one had any complaints with it, he adds. The science behind Eload is pretty straightforward. When we sweat, we lose electrolytes which must be replaced, particularly during long periods of exercise. Stoddard says other sports drinks do contain electrolytes, but in amounts far less than those in human sweat. Electrolyte levels can vary from person to person, but on average, they’re about two or three times greater than those in mass-market sports drinks. Someone who sweats heavily might: have electrolyte levels up to five times greater than those in a standard sports drink. So when athletes drink them, they aren’t adequately replacing electrolytes, Stoddard says. The problem is exacerbated when some people dilute drinks like Gatorade because they find them too hard on the stomach during exercise. Eload has much higher electrolyte levels; high enough that it required Health Canada approval as a drug because of its potassium and zinc content. It also contains dextrose, the same readily absorbed carbohydrate used in medical re-hydration solutions. To buffer the effects of lactic acid, the substance that makes muscles sluggish and causes muscle “burn”, Stoddard added multicitrate, which converts to bicarbonate in the body. And Eload is milder-tasting than other sports drinks, to help avoid stomach upset. Part of the problem in developing the drink was getting enough sodium in it without ending up with a solution better suited to packing olives. Stoddard accomplished this by adding sodium citrate, which doesn’t have the same salty taste as sodium chloride, or table salt. And because each person’s electrolyte needs differ, the drink can be customized by adding Eload Zone Caps – booster capsules that bump up its strength. Unfortunately, there’s no magic gizmo that will analyze your sweat, so the only way to know if you need booster capsules is by trial and error. Stoddard says in general, people who sweat a lot, or those whose sweat leaves salt stains on their skin, are more likely to need more electrolytes. When levels of electrolytes and particularly sodium drop, cramps, nausea, dizziness and delirium can result. The symptoms of low blood sodium can be mistaken for dehydration, though the two often go hand-in-hand, says Stoddard.